But as far as I’m concerned, Mary is always going to look a lot like Imogene Herdman–sort of nervous and bewildered, but ready clobber anyone who laid a hand on her baby. And the Wise Men are always going to be Leroy and his brothers, bearing ham. Even if you have no children with whom to share this story, read this one. It’s good. We revisited The Polar Express yesterday and enjoyed pulling out the paints and brushes for a little related art project. There’s really not much for me to say about this picture book classic, so I won’t. However, I will point you in the direction of a great resource book I’ve used a few times with my girls and expect to use even more as they get a little older. It’s Storybook Art: Hands-On Art for Children in the Styles of 100 Great Picture Book Illustrators by MaryAnn F. Kohl and Jean Potter. 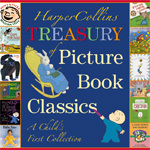 It contains art projects that mimic or somehow highlight the styles of art used by 100 picture book illustrators. I’ve been completely enamored of this book since I’ve had it, and I’m really itching to be able to use it even more with my girls. I do have one more little bit of business to take care of this Read Aloud Thursday! A giveaway–from last week’s Read Aloud Thursday anniversary post! Someone is going to have a great little big anthology coming to her door. . . .
Every year I think of wrapping my books up for the girls and always remember a few days after the start of December. Maybe next year. I’m not sure I’ll get time to do a read-aloud post today … or pick a favorite Christmas book! I’m going to go with The Night Before Christmas because it’s a childhood favorite. If you asked my N2, she would pick The Grinch and if you asked N1, she “might” pick The Nutcracker because we are reading through it right now, but who knows? Stephanie, I’ll be emailing you ASAP to get this wonderful collection on its merry way to your home! So how about your family? What are you reading together as Christmas nears? Please leave a link to your blog entry below, or simply leave a comment. YIKES! Just a week till Christmas Eve! That’s neat that the girls knew someone in the play! We read that one this year too. A Polar Express art project sounds fun. How I hated the movie of that book! But the book itself is all right. Great pictures. My post is on Good King Wenceslas, and assorted musings, this week. I remember going to see a performance of The Best Christmas Pageant Ever when I was in fourth grade. I read the book afterwards, and loved it! Will have to check and see if our library system owns Storybook Art. Always looking for new ideas. We read about snowmen this week. I’m happy to have spent the week with Christmas titles again. I’m really glad that you commented on the Christmas Pageant book. I just picked it up at Goodwill. I read it when I was a teenager and have ZERO recollection of the story. So I repurchased it in good faith and was hoping it was worth it. I don’t know if I’ll get to it this December, but it will be pulled out and read again next Christmas season if nothing else. Anyway, thanks for talking about it! Congrats to Stephanie. I remember the first time I heard about “The Best Christmas Pagent Ever” and I thought it was going to be a sappy, tacky story… I was so wrong. Wel also read The Best Christmas Pageant Ever and loved it. I think I loved it more than my daughter. She had a real problem hearing Imogene taking the Lord’s name in vain. This may become a Christmas classic to read every year. I can’t remember how old your girls are, but I think if Best Christmas Pageant is a challenge, then the stories in Newbery Christmas would be better for next year or even the year after. One of my favorite books for children, especially, girls is in the Newbery Christmas book: The Hundred Dresses. Beautiful story, beautiful lesson.